Research in 2014 through 2016 demonstrated that N application at green-up generally resulted in the greatest economic return compared to application at Zadok’s growth stage 30 (GS30, approx. Feekes 5). See past articles for details: https://npketc.soils.wisc.edu/2017/03/25/tips-for-nitrogen-management-in-winter-wheat/ and https://npketc.soils.wisc.edu/2016/03/09/time-your-spring-nitrogen-applications-to-maximize-winter-wheat-yield-2/. In this same study, we had a couple of fall N application treatments. We found that 120 lb N/a applied as SuperU at planting yielded the same as 120 lb N/a as ammonium nitrate applied at green-up at five of eight sties years (Table 1). 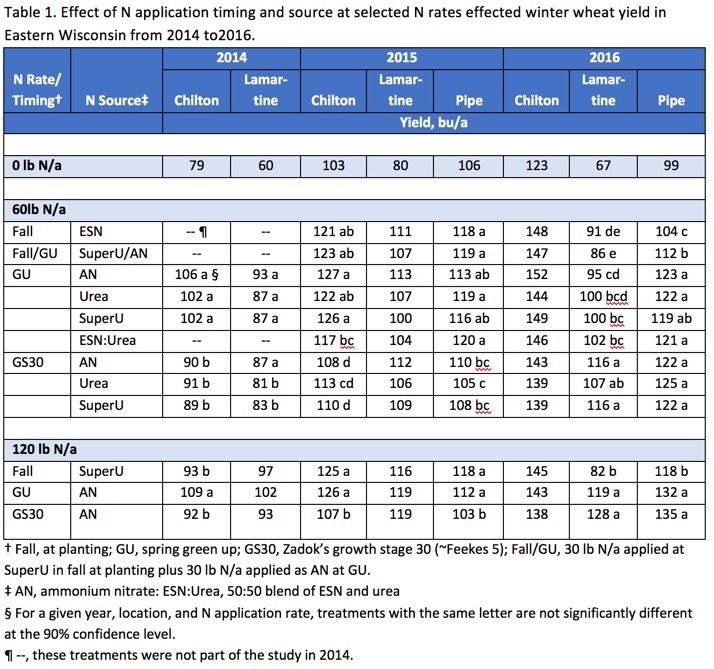 However, this rate was an over application of N at all five of these sites, so it’s not surprising that there wasn’t a yield difference between fall and green-up applications. At Chilton in 2014 and Lamartine and Pipe in 2016 fall application resulted in significantly lower yield than green-up application. These data suggest that some N loss occurred in fall and early spring. Additional treatments evaluated the effect of N application timing and source when 60 lb N/a was applied. This rate is an under application of N relative to the economic optimum N rate for the green-up application at all sites except Pipe in 2015 and was very close to the optimum N rate at Chilton in 2014. Using suboptimal N rates is helpful to evaluate how different N sources and timings perform. Fall and fall/GU split applications yielded similarly to green-up applications at four of six sites (Table 1). At the other two sites, substantial fall N loss resulted in reduced yields with fall N applications. Growers should consider fall application of N to winter wheat with caution. If a wet fall is forecast and/or fields are known to be wetter, waiting to apply N until green-up may be prudent. The N lost under these conditions will have a negative impact on profitability. Has April rain and snow caused loss of March N applications to winter wheat?